ACTECH ACT Series Plasma Cutting Machine had been used in all types of industry ranging for light duty operation to all day production. We develop, design and manufacture and sell our machine in house, we want to keep the machine price down by selling direct to end user and we have engineered the machine to use most quality mass produced components and software from world renowned vendors. * Cutting above maximum cutting thickness require edge start. 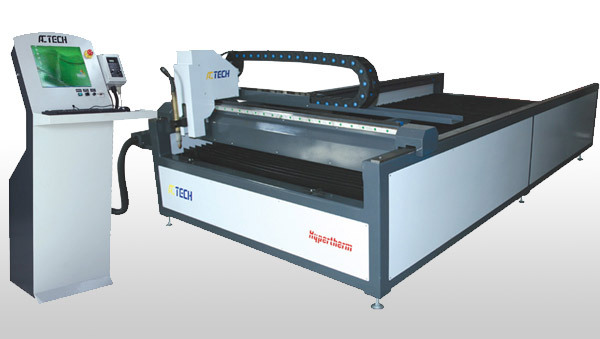 ACTECH CNC Plasma Cutting Machine is fabricated with heavy-wall structural 3” steel tubing. Steel tubing is welded together to form the 60” x 120” cutting table. The machines are supplied with slat support brackets and 3/16” thick steel strips for every 2” distance. The table can be loaded up to 2” thick 10’ x 5’ size mild steel plate. Don’t be satisfied with the compromising other machine maker make with extruded aluminum profile which is not build to be reliable. This should be considered when buying a machine that’s intended to be used for more than a hobby. ACTECH CNC Plasma Cutting Table uses 3 units powerful made in Japan 500W servo motor with continuous stall torque 2.16Nm ( 28702in ) instantaneous maximum torque 16.7Nm ( 222102in ). Rack & pinion drive system on X & Y axis and ball screw drive system Z axis. The X and Y axis rack & pinion drive system design to eliminate gear backlash with an anti backlash mechanism. You will find others system use only stepper or low power motor to drive the heavy gantry and causing lost steps or unsmooth motion. The servo motors with encoder feed back will achieve superior accuracy, speed and acceleration compared to stepper motor drives. Servo drive is a must for a commercial use machine. Our CNC Controller CMC2 consists of a large display of the cutting tool paths & easy to use window based interface, is intuitive and used friendly. All commands buttons are displays on one page and allows you to work extremely fast and easy. 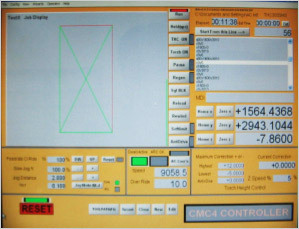 Visual G-code and M-code function display and you can start the cutting process at any line of G-code command you will. A built in G-code editor is there to allow you to make change to the file as desired. Feed rate override – cutting speeds can be adjusted while the file is running. This allows us to fine tune the cutting speed to achieve the better cutting quality. Real time preview windows show the file being processed and cutting position includes zoom capability. Our CNC Controller CMC2 has all the same factures, as well as many more than a controller running a USD 150,000.00 machine. Our I CAM Software allows you to open or import DXF and PLT files from Corel draw and auto cad. The ease of use of this CAM Software is second to none. This program will converts the drawing shapes into G-code for cutting. You can set the speed, dwell time far piercing, cutting kerf width for cutting different material and thickness. ACTECH’s Intelligent Digital Height Control monitors the voltages of the plasma are to maintain the distance between the torch tip and the material being cut. At every start cutting point, the torch will be lower until it torches the material and then lift the torch to a specified pierce distance. The pierce height is very important to increase the consumable life especially cutting thick material. During the cutting process, intelligent digital height control will maintain the perfect distance at all times accounting for material warpage. You also able to adjust the setting at anytime during a cut. Just plug the electric power supply and compressed air to the machine and the machine is ready to run. We offer the system in the one convenient and easy to use package. We also supply you some files for you to start the cutting right away. With the ACTECH CNC Cutting Table, you have the heavy duty Z-axis structure & torch holder which you can’t find on other machine of its class. This is designed to minimize the damage of machine in case of collision between the cutting head and cut work pieces. All ACTECH CNC Cutting Table come with a 12 months warranty on Parts. You can upgrade the CNC Cutting table for oxy/acetylene cutting with an addition oxy/fuel kit. The kit comes with one addition control panel, 3 solenoids valve & hose and a machine cutting torch. 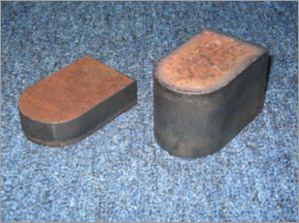 The torch can cut from 3mm to 300mm thick material with a nice cutting surface and minimum dross.